Find hotel near Agro Technology Park In M .. The natural allure of Cameron is certainly an inspiration for the manmade beauty of this place. As you visit the Agrotechnology Park in Cameron, you come across one of the most beautiful human attempts of showcase pruned nature. Thus, there is an English Garden, Herb Garden, Orchid Garden, Rose Garden, research centre and an information centre, that collectively become a part of this park and offer you a rendezvous with nature. Established in 1926, this British park overwhelms you with a variety of roses, strawberries, succulent fruits and many other assets. The cafeteria serves up refreshing teas, juices and a range of snacks. By rented car from city centre. Love this? Explore the entire list of places to visit in Cameron Highlands before you plan your trip. Fancy a good night's sleep after a tiring day? 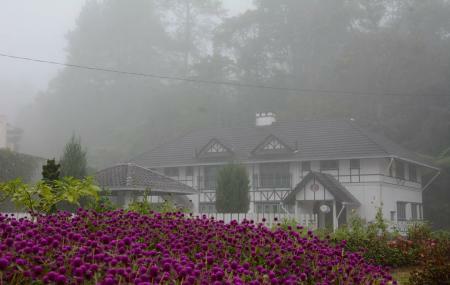 Check out where to stay in Cameron Highlands and book an accommodation of your choice. How popular is Agro Technology Park In Mardi Caameron? People normally club together Church Of Our Lady Of Mount Carmel and Sam Poh Temple while planning their visit to Agro Technology Park In Mardi Caameron. For someone who looks into the nature, this is the place. It cost you RM5.00 per adults. Basically, flowers will be the main attraction over here. Apart from the flower, the is one unique tree namely Rainbow Eucalyptus located at parking bay. Unique due to tree looks like unreal tree. This is a recommended place for everyone to visit which is nearby the bus station. There are many beautiful flowers to look at and take pictures. You can scan the QR code to learn more about the flowers. You will see different parts of the park such as strawberries farm, vegetables farm, herbs and tea garden. If you are interested, you can feed the rabbits for RM2. There is also an observation tower to view the scenic Cameron Highlands. If you are hungry, you can easily find snacks and food (3 restaurants/cafe with one of them selling strawberry based desserts, few stalls, and a few food trucks nearby the entrance). The place is overall well maintained but during my visit, some place are closed down (perhaps due to under maintenance), notably the orchid and butterfly garden. Also, I wish there was someone to guide through the tea factory which by the way looked deserted. Some educational information were provided about the tea but limited. Ticket price for adult is RM 5 and RM 3 for kids. So, I hope more educational and fun activities are included to make it worth the price. Hi! If you're having vacation in Cameron, you should consider to come to this place. Fees: RM5.00(adult) if school cheaper Things to do: photoshoot, walk, eat, buy and chill - there's rabbit and butterfly farm here. The flowers are all well taken care of. They also sell flowers and plants, I consider it's moderate price. You can buy fresh vegetables here and you can also buy some street foods here to fill up your tummy. It's a place you should bring your children and family to. Happy vacation! This place is also great since it is organize by Mardi. beautiful scenery and can explore many things such as rabbit farm, strawberry, butterfly and etc. The entrance fees are required before you enter. Unfortunately I lost the tickets so I cannot show it to you guys. The strawberry ice cream is RM 4 per cup. Sweet a little bit sour is great combination for it. Easy to get food since a few food trucks there but I not sure whether they just attending event by Mardi or permanently open it there for public.